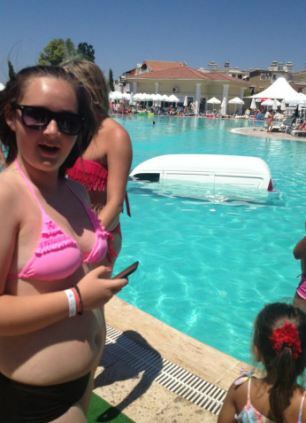 This is the bizarre moment holidaymakers were stunned to see a laundry van roll into a busy swimming pool at a Turkish holiday resort. The white van, which was almost entirely submerged in the pool, made its way down some steps and into the pool after its brakes failed, according to witnesses. 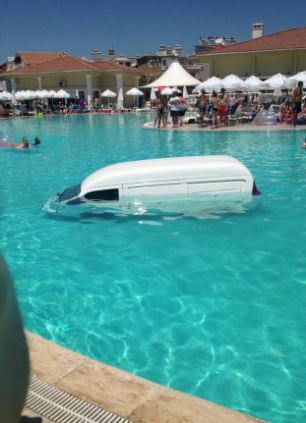 The incident appeared to cause some excitement at the pool before holidaygoers helped strap the van to a crane to pull it out of the water. 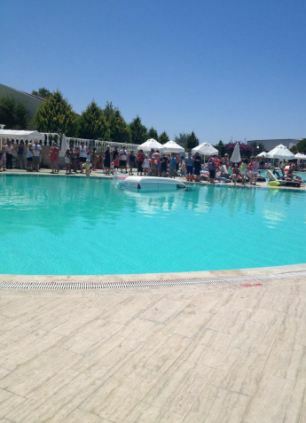 The peculiar incident took place before tourists at the Palm Wings Beach Resort, Altinkum, on Thursday. 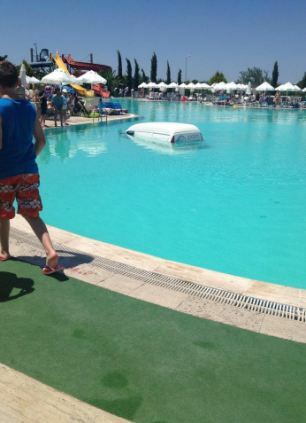 The pool was swiftly cleared after the vehicle rolled into it, as holidaymakers stood by the side and watched the scene unfold. 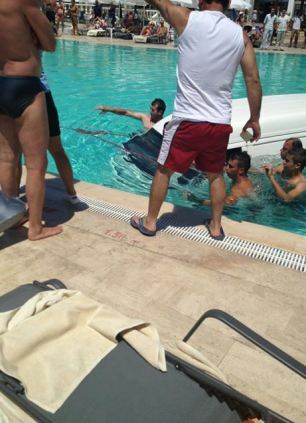 A group of men, who appear to be on holiday at the resort, help out as the vehicle is guided towards the side of the pool. Pictures show the van then being strapped to a crane in an attempt to get the vehicle out of the pool. The Palm Wings Beach Resort is in the western Turkish town of Altinkum, situated on the Aegean Sea. The family-oriented resort is a large complex spread over palm-tree dotted gardens and has its own white-sand beach. Altinkum istelf is situated within the city of Didim, located in the Aydin Province. The area is a tourist hot-spot, with visitors mainly coming from Turkey and Britain. In recent years however there has been an increase in the number of tourists from countries including Hungary, Bulgaria and Romania.